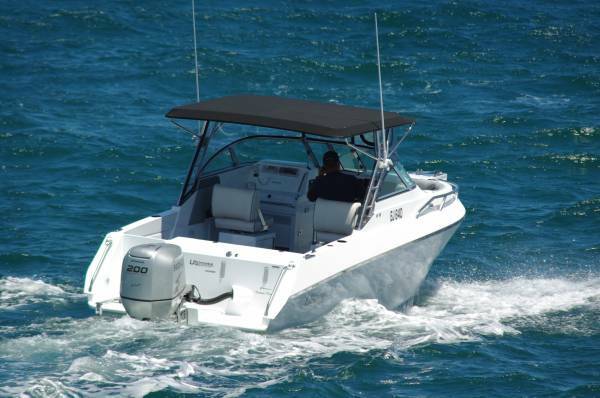 This week’s review boat is something very special in bow riders. 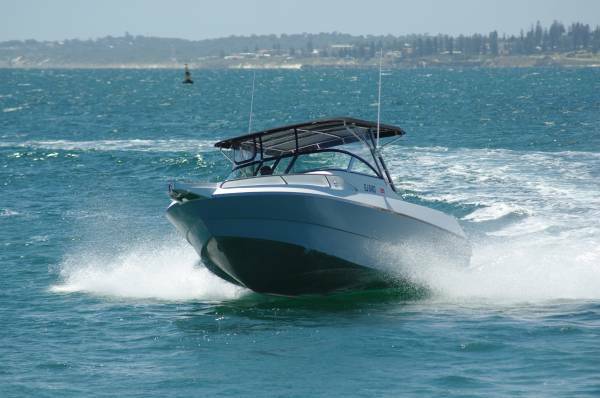 Custom built from the first line on paper, it was designed to be at home on the ocean, to be versatile even by bow rider standards, and to have form and finish virtually indistinguishable from fibreglass. A typical plate aluminium bow rider might use eight pieces of metal to form sides and bottom; to achieve its complex shape the Ultimate by Design 640 uses 32. Without benefit of filler, the welds are undetectable without special scrutiny. A look around the boat suggests not a straight line anywhere. Designer Billy Plug created the basic 640 in the computer, and then modelled it in varying stages of load, adjusting items like chine width and deadrise. 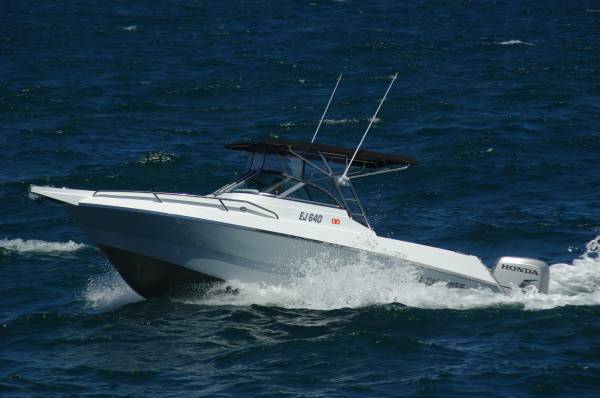 The result is a boat that has no use for trim tabs, holding ideal trim almost regardless of where passenger load shifts. The hull shape has great stiffness, and hence a lack of resonance; combined with foam filling, its lack of noise when travelling gives the sound as well as the looks of fibreglass. 6.4m is on the big side for a centre console, and the space has been shared out well. The bow cockpit so often requires a squeeze from adults and is often designated children only, but here four adults have plenty of room – so much that there is space left over for a drop-in table or an extra seat. Even better, once anchored an awning zips into the main canopy, supported forward by a pair of drop-in poles; shade that is rare on this style of boat. The aisle between the two consoles is wide enough for unimpeded walking, and the cockpit you reach has been designed for unimpeded fishing or whatever else you choose. Almost all of it is shaded, and the driver and navigator have the extra shade of a big eyebrow on the canopy. 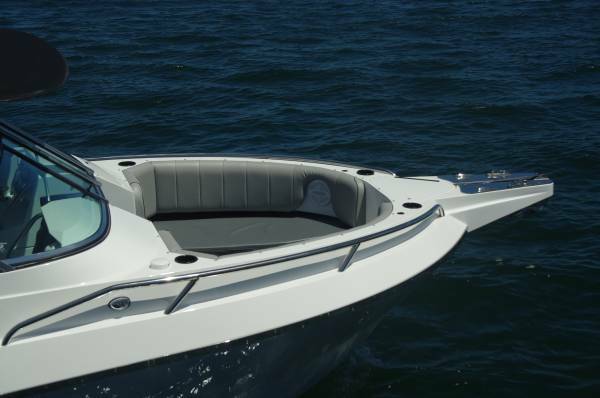 For security of children and anglers the coaming is exceptionally high by any standards. Although little storage is immediately obvious, there is a great deal of it on board. Each console has a lot of volume dedicated to specific items. Below the seat cushions the bow cockpit has lockers, the lids of which are carpet covered to let you leave the cushions at home when fishing. There are four lockers within the cockpit bulwarks instead of pockets, and below the deck are 500l and 400L lockers. The forward one is self-draining, and 2m long to take rods. The only two permanent cockpit seats are those at the windscreen; reversible models on two more lockers. But on both fore and aft faces of the transom are short vertical tracks: these take whatever accessories are wanted on the day. 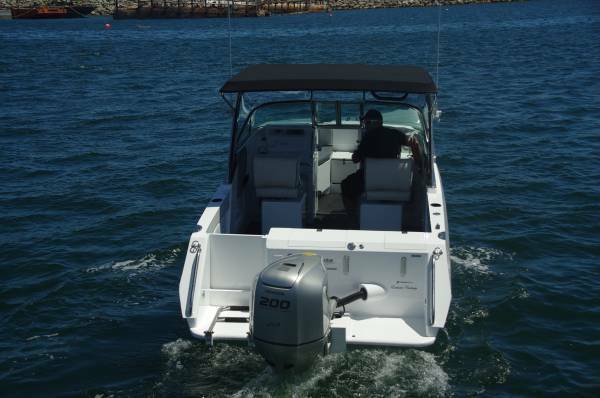 They include a lounge inboard and a set of rod holders outboard. The owner’s views on custom work saw practically every fitting to survey standards: switchboard, wiring, lights – even the foam. And everything was fitted with great thought. The rubbing strake is in stainless steel; the power windlass is concealed under a lid and controlled either locally or at the dash, the Cole Hersee switch is behind its own door; stubby holders are wherever a seated person can lay a hand; the consoles were tuned to suit the best nationally available curved armour glass. The list is almost endless. The looks and equipment are there, but even more impressive was the way it all actually performed. I tried it solo and with five passengers and was impressed both times. This is significant because extra weight can often give an enhanced feeling to ride and general behavior. We had a 200hp Honda on the back, and in the vigorous sea breeze nature had laid on were able to use all 200. 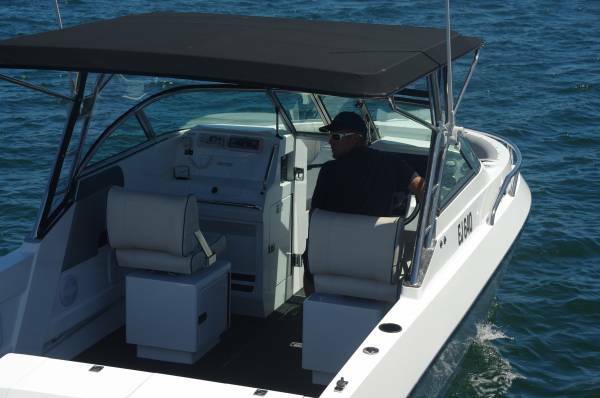 A bow cover can be fitted, but without it not a drop of water came on board. Ride and manoeuvrability were both exceptional. 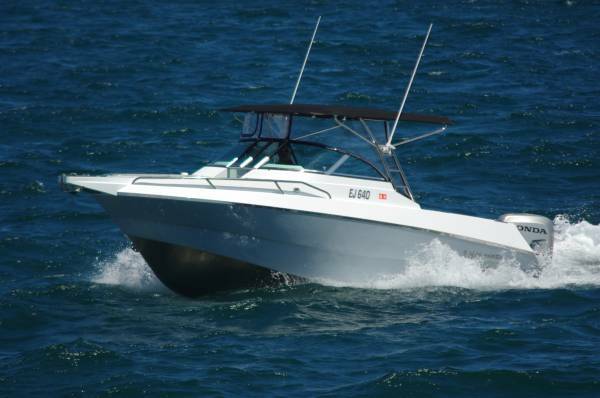 This is a true custom boat, built as such from scratch rather than being a stock boat with modifications, yet the price tag was surprisingly modest: $120,000 including the trailer. 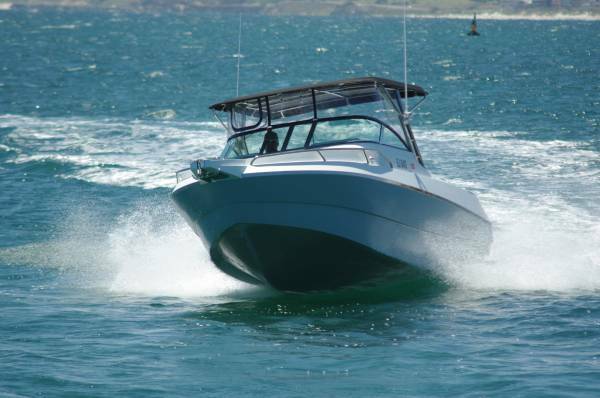 And even that was custom built: hit it from practically any angle and it aligns the boat for driving on.